This 1995 Hallmark ornament is fashioned after the Hallmark Kiddie Car Classics Pedal Cars. It is 2nd in the Kiddie Car Classics ornament series & is made from die-cast metal. 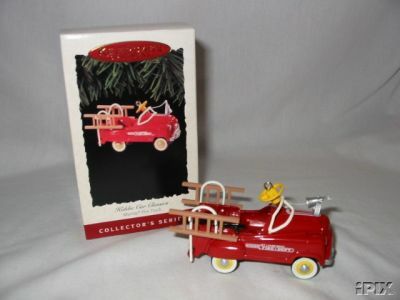 Items Similar To "Murray Fire Truck~1995 Hallmark Pedal Car Ornament~#2 Kiddie car ..."